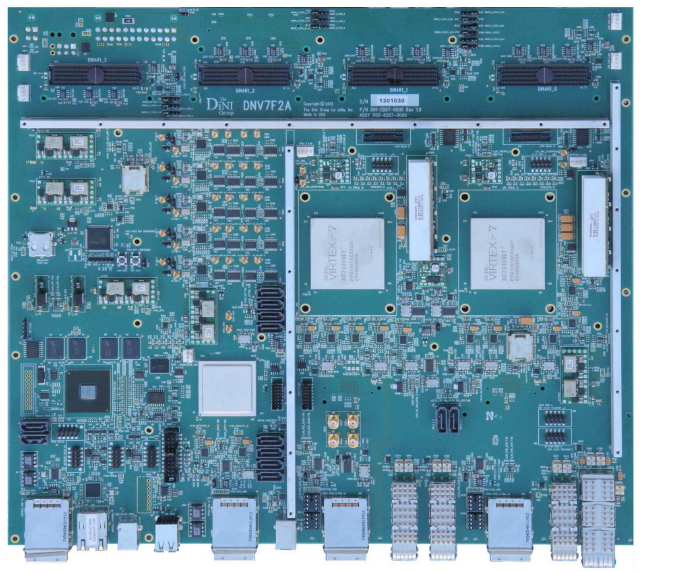 The DNV7F2A is a complete logic prototyping system that enables ASIC or IP designers a vehicle to prototype logic and memory designs for a fraction of the cost of existing solutions. 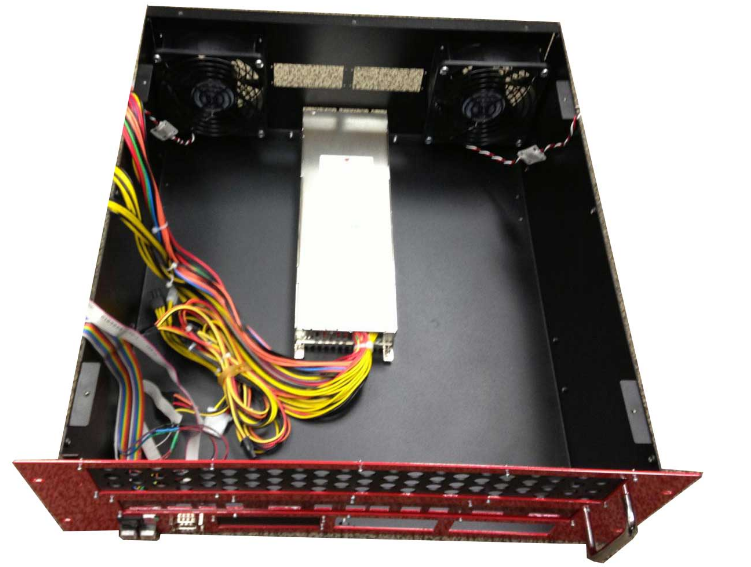 The DNV7F2A is a stand-alone system and can be hosted by 4-lane PCIe cable (GEN1/2), USB or Ethernet. 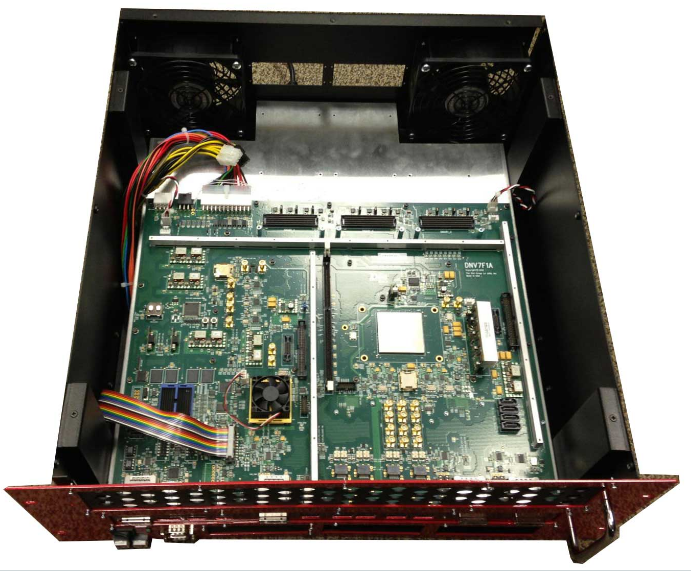 A single DNV7F2A configured with two Virtex-7, 7V2000T can emulate up to 28 million gates of logic as measured by a reasonable ASIC gate counting standard. Two DNV7F2As can be linked together, doubling this gate count to 56 million seamlessly. More DNV7F2As can be linked together if the design grows larger. The gate count estimate number does not include embedded memories and multipliers resident in the FPGA fabric. One hundred percent (100%) of the Virtex-7 FPGA resources are available to the user application. The DNV7F2A achieves high gate density and allows for fast target clock frequencies by utilizing FPGAs from Xilinx's 28nm Virtex-7 family. Two DNV7F2As can be stacked together to double the resources. This page here has more detail: 'Stacking Two or more DNV7F2A board together'. All functionality is seamlessly maintained including the high performance data movement via the NMB busses. When two DNV7F2As stuffed with the 7V2000T are stacked, the resulting system can handle at least 56 million ASIC gates. If more DNV7F2As are stacked together, the gate count grows accordingly. If you need to stack a large number of DNV7F2As, please call in, since additional hardware might be required. The DNV7F2A uses a high I/O-count, 1761-pin flip-chip BGA package (FFG1761, FHG1761). 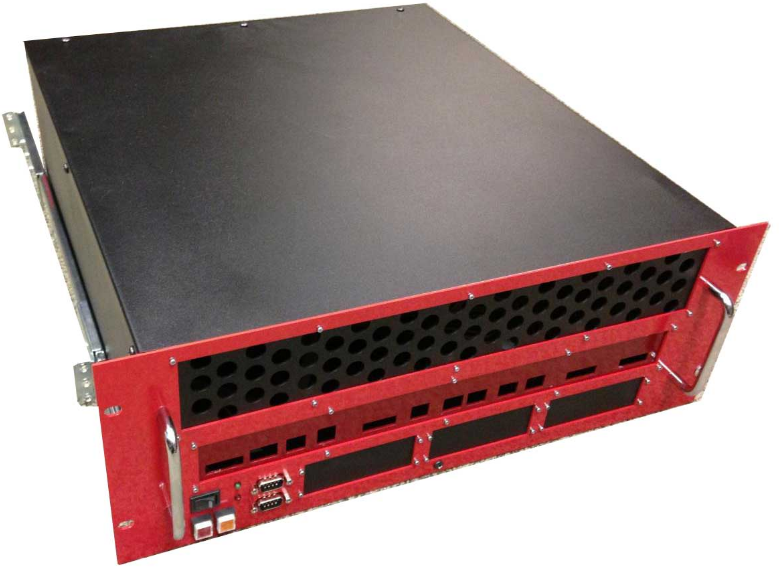 In this package, the largest device, the 7V2000T, has 850 I/Os. All I/Os are utilized. Abundant fixed interconnects (either differential or single-ended) are provided between the user FPGA and the configuration FPGA. 100% of the resources of the two Virtex-7 FPGA is dedicated to the user application. The maximum density stuffing option utilizes the 7V2000T. When stuffed with two of these devices, DNV7F2A is capable of prototyping >28 million gates of ASIC logic with plenty of resource margin. This is a ground breaking device and the first to utilize 2.5 silicon dimensions. Prior to the stacked 7V2000T, the biggest challenge in FPGA-based ASIC prototyping was logic partitioning. This difficult task is nearly eliminated with this large quad-slice device. The DNV7F2A uses a connector standard called DINIARRAY (DINAR1), which utilizes 320-pin Samtec SEAM series connectors. Two of these connectors are attached to the user FPGA, enabling expansion, customization, and stacking. This is a non-proprietary, industry standard connector and the mating connector is readily available. We can provide the mating connector to you at our cost. We are not fans of proprietary, hard-to-get, outrageously priced expansion connectors. The 150 signals (72 pairs) to/from each of these expansion connectors are routed differentially and can run at the limit of the Virtex-7 FPGA I/Os: 710 MHz (assumes -2 or faster). Clocks, resets, and presence detection, along with abundant (fused) power are included in each connector. Memory can be added to the DNV7F2A via the DINAR1 expansion connector using the DINAR1_SODM204 expansion card. Each DINAR1 can host a single DINAR1_SODM204 expansion card, so as many as four of these cards can be used DNV7F2A. The DINAR1_SODM204 has a single 204-pin SODIMM socket. Off-the-shelf DDR3 SODIMM modules work fine, allowing you to add up to 8GB of low cost memory in each DINAR1 position. In addition, we have compatible SODIMMs in the following variations: flash, SSRAM, QDR II+, mobile SDRAM, mictors, USB2.0 PHYs, and more. 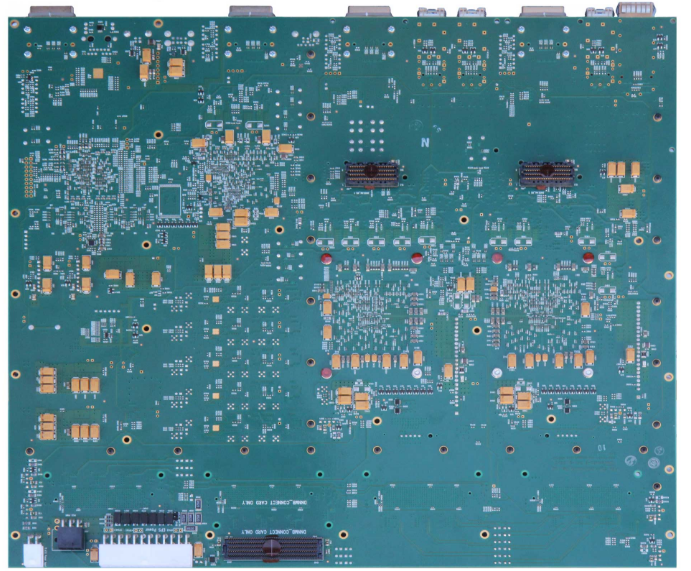 As with all of our ASIC emulation boards, the DNV7F2A is loaded with LEDs. The LEDs are stuffed in several different colors (red, green, blue, orange et al.). There are enough LEDs here to adequately illuminate a medium sized dungeon. When testing this make sure an adult is present and don't electrocute yourself. These LEDs are user controllable from the FPGAs so can be used as visual feedback in addition to the party enhancing. A JTAG connector provides an interface to ChipScope, Textronix Veridae and other third party debug tools. l Dual SEARAY GTP Expansion headers, 8-lanes each.